Frank and I are still dumbfounded and proud as can be! Proud of a community of people who responded to the idea of a music venue (community hot spot) being recognized on the national stage. 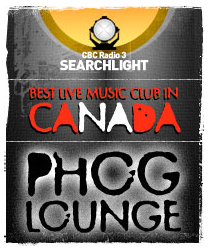 When this contest began over a month ago, we felt it would be tough to convince people that their “vote mattered”, and that the Phog fans from around Canada should go to cbcradio3.com every day and vote. Seeing the other venues on the list was overwhelming. The top 10 was a startling reminder that there are a LOT of other people out there who CARE deeply for Canadian music, CBC Radio 3, and their OWN arts communities. I truly wish I could visit every one of them. Today, I think a series of Windsoites and other music venue lovers understand that what you do can and DOES certainly make a difference. Participation in a common goal had our supporters jumping and screaming and breaking things when the announcement was made. They went loony tunes, because they were a part of something. They went to a website every single day because they were getting daily reminders from us, or because they simply remembered and were dedicated, and it happened. When you want something, and you participate in what it takes to make that happen with a mobilized group of inspired individuals, you succeed whether it ends in a victory or defeat paired with a tighter community. We are so thankful to everyone who cared enough to help. We can choose to say, “We’re right across from Detroit,” or we can say, “We’re the home of the best live music venue in Canada…across from Detroit.” Hahahaha…. Here’s video of the celebration open mic we held last night over live video stream. It was so fun to have a who’s who of performers and supporters trickle in all day and night. Remarkable community this independent music environment fosters. All we can hope for now is that Windsor venues are on the tour stop for more performers who were unaware of the vigor of this town until 24 hours ago. 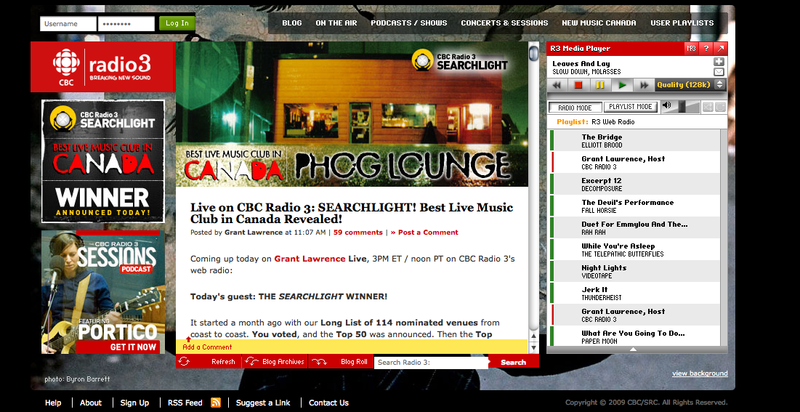 This entry was posted in Uncategorized and tagged best live music venue in canada, cafe, canada, cbc radio 3, detroit, entertainment, events, indie, live music, lounge, ontario, phog, venue, windsor, winner. Bookmark the permalink. the enthusiasm and humility that Tom exudes is fantastic. he is absolutely right to say that the community DID this and it HAPPENED. but, we do need to recognize the immense amount of work and dedication that both Tom and Frank have given to running Phog for over 5 years. this campaign was instigated and continually fanned by Tom and all his enthusiasm. It takes a lot of time, hard work, long hours and commitment to operate a bar. I’m sure they cleaned a couple of toilets in the last few days. now juxtapose that to being named best live venue in the country. the range of commitment and dedication is amazing. We need to thank both of you for the sheer accomplishment as well as the spark that you created in this community. we all know that there’s a fire brewing under all of us and we thank tom for igniting it in us all. Cheers to all of us and thanks to tom and frank.